Our Road Map to Enhance your Desktop. Track and monitor application usage based on tasks. Set Productivity goals easily and monitor your progress live with our productivity meter. Distraction free modern user interface components built on top of 2D Accelerated View, currently we use Qt for rendering, but our goal is to replace this with system native rendering API's, such as Quartz 2D, OpenGL, and DirectX. Easily switch between UI Kit themes and customize the look and feel of your desktop. UI components are written in C++ to ensure best possible memory usage and performance. Yet Deeply Integrated with the operating system underneath. Seamlessly blends in with OS X, Gnome, KDE, and Windows Desktop Managers. Easily access core system services and monitor system hardware, such as battery or CPU usage. We work really, really hard every day, to make PlexyDesk better and greater than before. When we are done, Awesomeness will be packaged and delivered to your desktop! join us and contribute towards your Desktop Freedom Today! 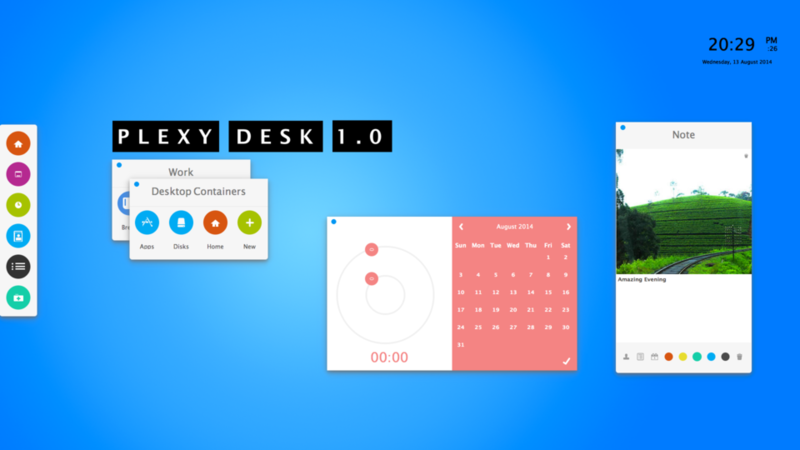 You can easily extend the look, feel and/or the behavior of PlexyDesk with Plugins. PlexyDesk introduces StorageKit API for back-end neutral data storage. It can save data locally or remotely and keep everything in sync. Our all new SocialKit API lets you handle XML and JSON web responses and map them into C++ data structures. Developed entirely with open source components and frameworks for optimal performance and security, with guaranteed interoperability. PlexyDesk will only load certified plugins on supported platforms. Fully compatible with Apple Sandboxing Model, and our OS X binaries are digitally signed with Apple Certification.